Simple, powerful marketing in your hands. Grab attention because boring has never converted well. Stand out in the inbox with stunning graphics and designs that get noticed. Create professionalism to show them you mean business. Send messages personalized with your contact info, headshot, and branding. Make sales by doing as little as possible. Use pre-approved, pre-created templates from the message-filled library. Send it from YOU not a server. Messages come from your email address and your email host – not some third party server. Be responsive so you look amazing on all your prospect’s devices. Send messages that are optimized to look incredible on laptops, tablets, and phones. Track responses because knowledge is power. Know when your prospect opens your message and what links they clicked. Use email and text to make sure your message is seen. 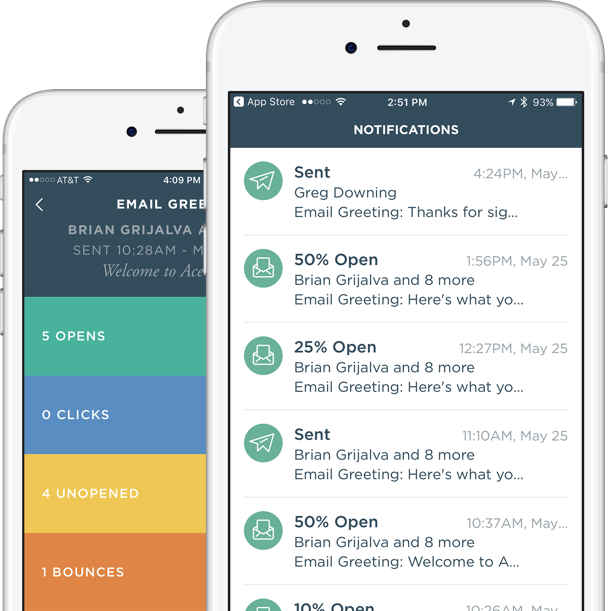 Combine email and texting to get an open rate of 90% or better. Customize your message to say it just right. Create your own message from scratch or edit pre-created templates. Schedule messages because timing is everything. Set your message to be sent at the optimal time for your prospect to open it. Automate a series when one email isn’t enough. Create and send a campaign of any number of emails over a period of time. When your follow up contains value, visuals, variety, and volume, prospects don't ignore you, they join you. Stunning Graphics Stand out and grab attention. Choose from hundreds of images or upload your own design. Deliver Professionalism Every detail represents you just right. Your photo. Your contact info. Your logo. Your colors. It all comes together perfectly. The Perfect Presentation Your message takes center stage. Designed to look incredible on every device, so you have your best chance to shine. Nail the 7-10 touch rule because research shows that it takes that many touches to make a sale. On average, prospects don’t buy until after the 7th touch - this is your tool to do it effectively. Follow up with ease and in style to Wow every prospect after every meeting and every phone call. The fortune is in the follow up. Make sure your follow up messages make the right impression. Create your own messages in seconds by adding your own graphics, text, and links. Add images, craft quick messages, and use trackable links to create custom emails. Automate a series to use repetition with ongoing follow up value messages. Click “Start Campaign” once to send any number of follow up emails at any interval you choose. Combine email and text to ensure your follow up is viewed by prospects. Share messages with your team so they can send the same messages you use. Every message you create can be shared to your team with the power of Sharecodes. Track on mobile using our iPhone app to get notifications when your follow up is opened. Notifications appear on the home screen letting you know the moment a message is viewed. Instead of attachments, use Dropbox/Box links to track when your content is downloaded. Value and frequency will develop your personal brand and drive appointments. Stay top of mind with pre-created, pre-approved content. Tap into a library full of pre-approved emails, graphics, and marketing kits. Tag team with your new blog to show them you mean business. Deliver value so your contacts see you as one of their primary financial resources. Each message is packed with specific concepts, strategies, and ideas for consumers. Schedule Messages to hit your contacts' inboxes at the ideal time. Send in seconds so reaching out to your contacts is easy. Browse the library, choose your message, select your contacts, send – it’s really that fast. Track then act to connect with contacts who are listening. When you know who is engaging with your content, you know who to call. Get replies to drive appointments. You never know when the time is right – that’s why it’s important to always be reaching out. Use simple and easy-to-create opt-in forms to turn leads into sales. Use opt-in forms as exhibit booth intake forms for visitors to submit their contact info and get added to your account. Use autoresponders with opt-in forms to communicate quickly with opt-in contacts. Use opt-in forms at events to gather contact data at networking events and trade shows. Use your laptop, phone, or tablet as a contact info gathering device and immediate follow up tool with our opt-in forms. Collect Contact Data on Your Webpages to capture leads from web visitors. Convert a visitor from one of the webpages we offer to a hot lead when they fill out an opt-in form to get an ebook or get your newsletter. Use Autoresponders with opt-in forms to fire off automated messages to opt-in contacts. Select any message from your library to send as soon as a new contact submits their data. Send trade show and networking event follow up info, videos, ebooks, and links. Grow a Solid Newsletter List by adding everyone who subscribes. Every message includes an unsubscribe link, allowing a recipient to block messages from you so you can stay out of spam-compliant trouble. When you know which messages perform best and who is most engaged, you can respond effectively and efficiently. See activity at-a-glance to scroll your messages, opens and click rates on one screen. A simple preview pane shows you your message with an activity summary at the top. View opens and open rates to see who’s engaging with your messages. Knowing who opened your messages gives you valuable information about which contacts are paying attention, whether they reply or not. View clicks to see which contacts are clicking the links in your messages. Clicks are the best measure of true engagement and when to call a prospect or client back. Opt-outs are managed for you. Every message includes an unsubscribe link automatically, allowing recipients to block messages from you and allowing you to stay out of spam-compliant trouble. Bounced messages are reported to keep your list tight and clean. A bounced message usually means an email address is old or spelled incorrectly, which alerts you to update your contacts’ email addresses. Review history by contact to view open and click trends. Absolutely no tech savvy needed to master all tools. Heck, there isn’t even any HTML to edit. What’s HTML? Forget we said anything about it. Email templates are designed and tested for maximum delivery to do everything possible to avoid spam filters, promotion folders, and trash folders. Recipients can opt-out of your messages for their privacy and protection, and your compliance requirements. Regardless of your plan, there are no limits to how many emails you can send. Plans are tiered to accommodate the amount of contacts you have. Need assistance or have questions? Give us a call.